As I was wrestling with this pumpkin, trying to cut through it — all the while thinking of several people who have commented that they enjoy winter squash recipes, except for the not-so-small detail of cutting them! — I stopped. 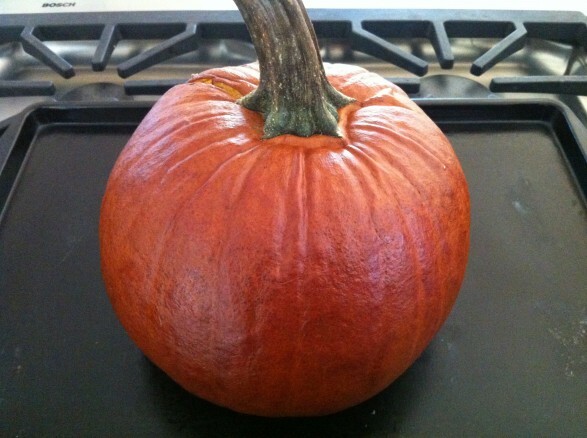 Why not try to bake the whole pumpkin and cut it once soft? By this point, I had managed a slit which was about four or five inches long down one side of the pumpkin. I figured that would be enough to allow any built-up steam to escape, avoiding a popping pumpkin in my oven! The results were fantastic; the seeds scooped right out and the skin pulled off easily. 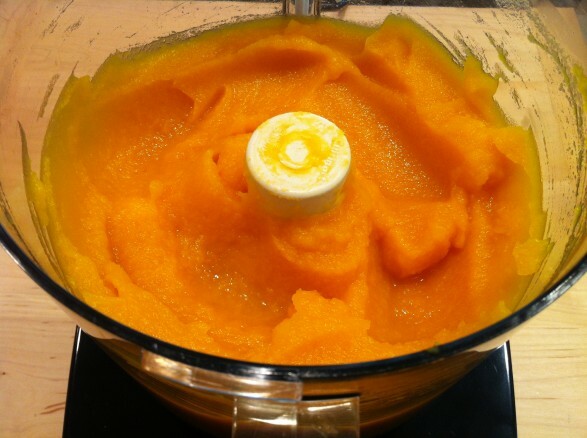 A quick puree in the food processor and I had three pounds of bright orange, fresh puree. The hardest part was deciding whether to make our favorite pumpkin muffins, pancakes, or baked oatmeal first! Baking the pumpkin whole, although unconventional, will save you the difficult task of trying to cut through a large pumpkin. 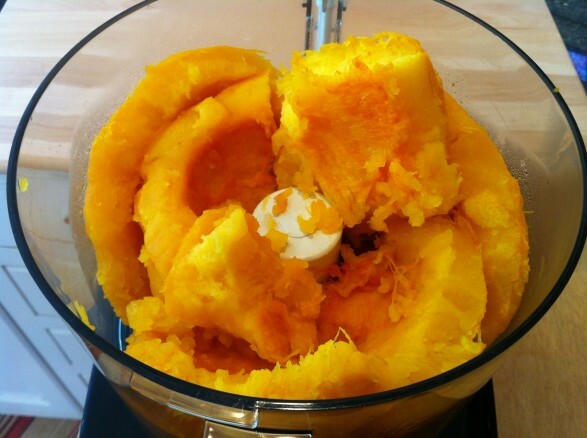 It also makes quick work of removing the seeds, which scoop right out once the pumpkin is soft. Just remember to make a slit in the side of the pumpkin so the steam can be released. My 4 3/4 pound pumpkin yielded 3 pounds of fresh puree. Wash the pumpkin and make a long slit in the side of the pumpkin with a knife. This will allow the steam to escape. 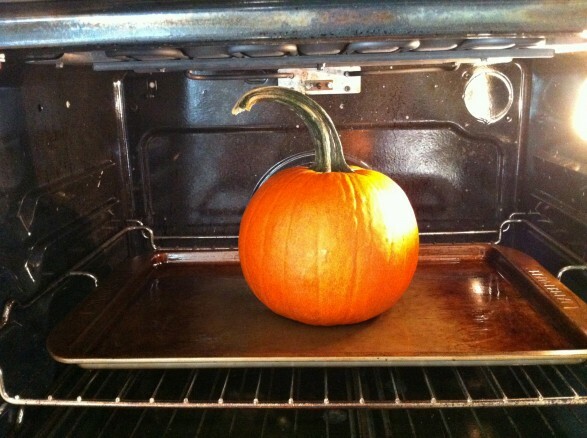 Place the pumpkin on a rimmed baking sheet and bake for 1 hour and 15–30 minutes. Cooking time will vary based on size of pumpkin and starting temperature. 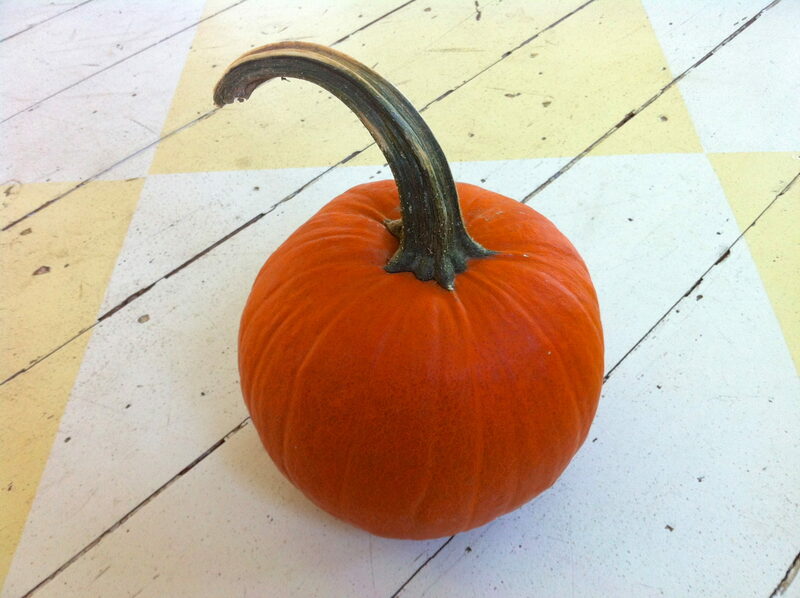 (If your pumpkin has been sitting outside and is very cold, for example, it will take a little longer.) Test with a knife. When inserted, the pumpkin should feel like a baked potato. If it is still firm, bake longer and continue to check every 10 minutes or so. Once tender, remove from oven and allow to cool until you can touch comfortably. 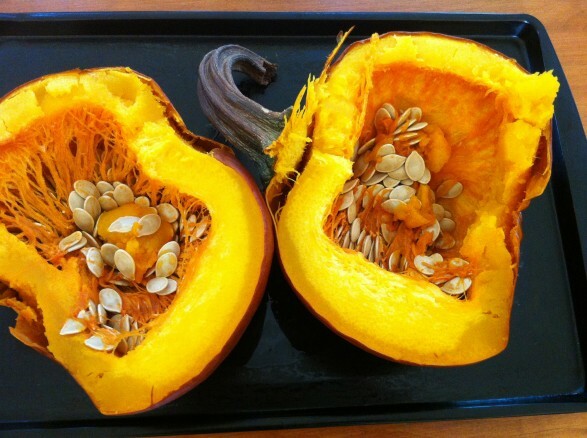 Cut the pumpkin in half, scoop out the seeds and reserve for later roasting, if desired. Peel the skin away from the flesh (I find it easiest to do with my fingers), and place the flesh in the bowl of your food processor. Processing in two batches works well. Process until completely smooth, scraping down the sides as needed. 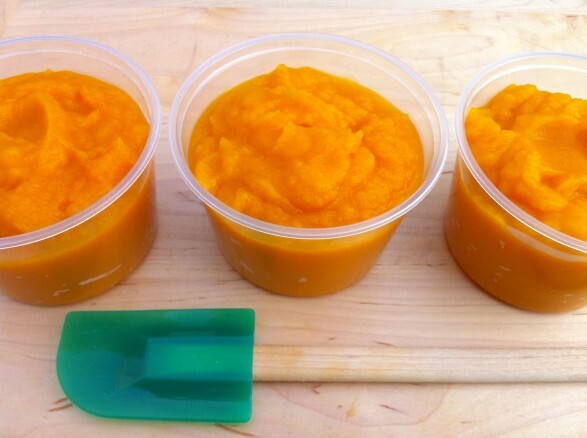 Transfer to containers and refrigerate for about a week or freeze. I’ll have to try baking it instead of the peel and steam route next time. It took me all day working in small batches to steam 5 pie pumpkins. But I have about 28 cups of puree in the freezer! Hi Bonnie! I commend you for being so productive! You must feel so accomplished to have 28 cups of puree in the freezer! Perhaps next time you can accomplish this much in less time with a new tip…in the meantime, enjoy baking with the fruits of your labor! I am thrilled this worked for you, Zena! Thanks so much for letting me know! Your method worked! Thanks Ann! I will be making the pie tonight . I’ll try to remember to get picture of it. I am so glad and would love to see your pie, Mary Lou. I bet it will be fantastic! Happy Thanksgiving to you! Pie was great! Had enough pumpkin and made 2 pies. My pre made crusts were not quite big enough but it worked out ok. Sent pie home with family and we have pie for us for weekend. This is an awesome idea! way better then the store bought pumpkin pure! Could I use a Blender instead of a food processor? Thank you, Steph! The only problem you may have with a blender is getting the puree to blend thoroughly without adding liquid. Depending on your blender, it may work though. You could also mash well, the puree just wouldn’t get quite as smooth. If you try, let me know how it goes! I have a pumpkin sitting on my table and it has been 5 days that I am trying to get to it to cut and bake…thanks for the tip. I am about to get up from here and turn on my oven. I want to make “empanadas”, Mexican turnovers. can’t wait to eat one! So glad you found this at the right time. I bet those empanadas will be delicious! Can not believe how simple this was!!! Easy prep, easier clean up. Seriously wish I had several pumpkins to do this at the same time. Can’t wait to use this purée in my great grandmas pumpkin cookies! It is easy, isn’t it? And your grandma’s pumpkin cookie recipe sounds like a recipe I would love to have: ) Enjoy!